The Harry Gwala District Municipality is located to the South West of the KwaZulu-Natal province. Its population is sparsely spread throughout an area of 11 127. 89997 square kilometers. 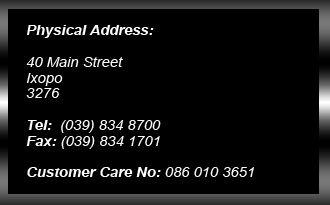 The Harry Gwala District municipality forms part of the border between KwaZulu-Natal and Eastern Cape Province. The District Management Area (DMA) is located to the West of the District and it forms part of the border between the KwaZulu-Natal Province and Lesotho. 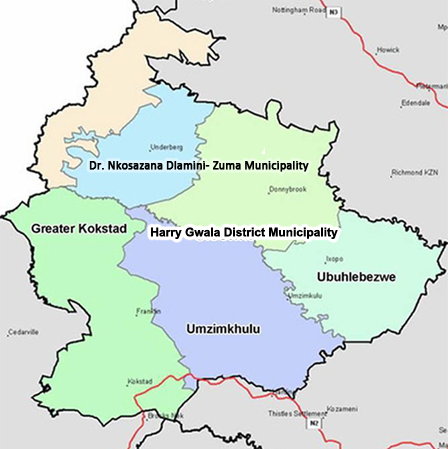 The Harry Gwala District Municipality (DC43) is composed of the following five local municipalities: Ubuhlebezwe; Ingwe; Kwa-Sani; Greater Kokstad and Umzimkhulu. By 2030 Harry Gwala District Municipality will be a leading water services provider in the KZN Province with its communities benefitting from a vibrant agriculture and tourism sector. Working together with its communities and stakeholders Harry Gwala District Municipality will ensure the provision of clean, drinkable uninterrupted water services and proper sanitation facilities and strive to improve its agriculture and tourism sectors to enhance human dignity. - By implementing Bulk regional Water Supply Schemes. - By implementing the localized based rural sanitation plan. The total population of Harry Gwala District Municipality is 461 419. The District has 4 Local Municipalities,Dr Nkosazana Dlamini-Zuma( Ingwe, KwaSani), Greater Kokstad, UMzimkhulu and UBuhlebezwe.